This will be examined at the level of diagrams and pseudocode. Students should be able to describe the most common data structures (arrays, stacks, queues, linked lists, binary trees) and the most common data processing operations on each of the basic data structures (addition, deletion and retrieval of data, traversal, searching for a given data, sorting of data into some order). This should be taught and connected to flow charts, pseudocode and programming in the SL/HL core. 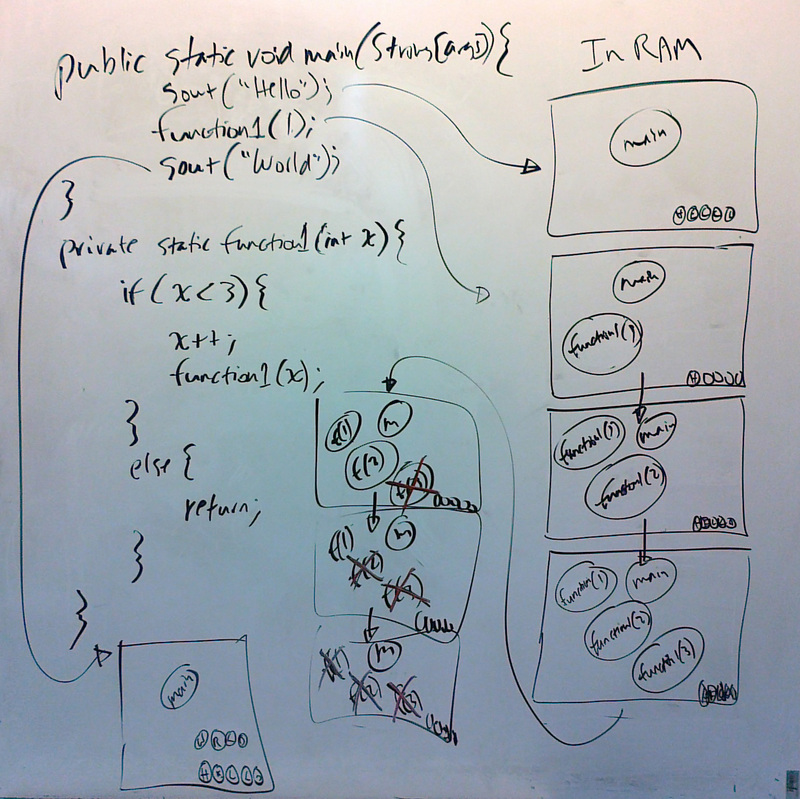 The basic ideas and their application should be illustrated with non-computer examples. Each basic idea should then be practiced in specific algorithmic contexts using concepts drawn from flow charts, pseudocode and programming. Identify a situation that requires the use of recursive thinking. Suggested practical activity: snowflakes and fractals, towers of Hanoi. ************ If not doing in combination with the OOP extension, maybe 5.1.1 - 5.1.3 for the OOP extension, where recursion is repeated. *** if only because stacking has not been introduced at this point in the curriculum. - Any situation where the easiest way to see how to solve the problem by solving a problem similar to it, but with a slightly different set of values. In fact, if we're saying ***require***, it's possible that an iterative solutions will not work at all anyway. Recursion Analogy 1 - "George"
I answer, "He's Alexander's brother". But with this information, you still don't know who George is because you don't know who Alexander is. So you have to break down the problem further ("divide and conquer principle"), and ask another instance of the same sort of question ("self-same principle"). I answer, "He's Elizabeth's father." I answer, "Oh, that's actually Liz's real name." I answer, "Liz is Billy Smith's mother." "Ah ha!, I know Billy Smith". This is what we call the "base case"; meaning the case where, having drilled down several levels, there is finally "an answer", and no more recursive calls are required. who has a brother named George. George is Billy Smith's mother's father's brother; i.e. Billy Smith's great uncle. The recursive method is asking who_is a certain person, but each time you call the method you are sending a different argument. And fortunately there is a base case which is a person that you know, so all the questions are answered (in LIFO fashion), all the methods thus completed. 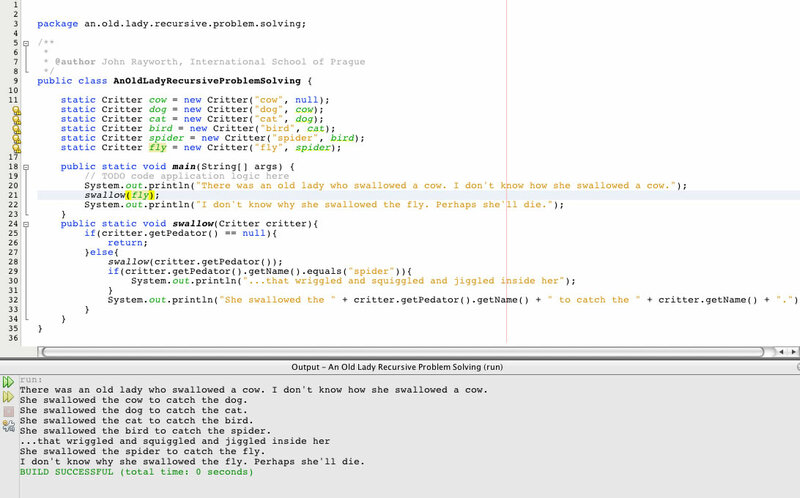 Recursion Analogy 2 - "Antananarivo"
Wow, you're a really good programmer. At some point I'd like to come over and do some recursive programming with you. So tell me, where do you live? Fine. That rings a bell... where_is(Antananarivo)? Madagascar... heard of the movie, but where_is(Madagascar)? It's the big island country off the east coast of Africa. 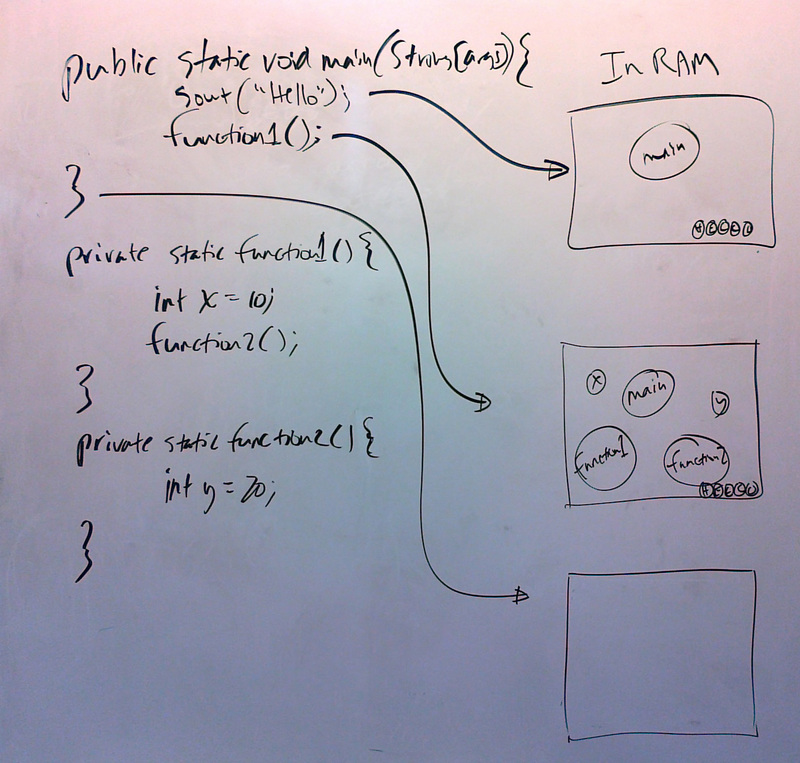 Recursion Analogy 3 - "The Little Old Lady"
How come that little old lady over there swallowed a cow? She swallowed the horse to eat the dog. She swallowed the dog to eat the cat. She swallowed the cat to eat the bird. She swallowed the bird to eat the spider. She swallowed the spider to eat the fly. and she swallowed the cow to catch the dog. Gotcha! With the Little Old Lady nursery rhyme, each time through we ask a question and can only answer it by asking further, similar questions. The nursery rhyme actually ends up with the cute, but non-recursive, "she swallowed a horse, she's dead of course." But on up to this, culminating with the cow, each question is answered recursively with other similar questions, down to the base case of her having swallowed a fly. Indeed the only way to get to the bottom of this case is to keep on asking the "why did she swallow a..." question, until there is a reasonable answer (noting that little old ladies do indeed, at times, swallow flys which inadvertently buzz into their mouths). And note that for the print out to work, the position of the println( ) will have to be moved within the swallow( ) method. Check out these YouTube examples of snowflakes and fractals, towers of Hanoi. "You can't win the game. It only exists to destroy your mind." And I think due to its recursive nature it will destroy your computer too... or at least slow it down a whole lot. So be careful! With the Towers of Hanoi problem, you have to move all of the disks from one pole to another, using a third; the only thing is you cannot ever put a larger disc on a smaller one. 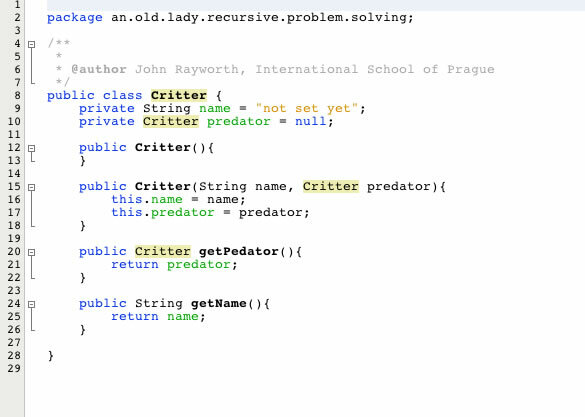 See below for the Java recursive solution. You can do an iterative solution, but it's four times as long, and harder to read and follow. Plus a couple of other brain twisters. Thanks Ta! And one more interesting application of recursion to adjust lighting in a game at java-gaming.org.